It is complex yet recognisable, it is exotic yet familiar, it exhumes mystery while shedding new light on old tropes, and its progress is very hard fought, at every level. Yes, the world is – or may be – a better place, but not before we have worked and thought very hard to get there. A lot of this has an empty ring to it, it sounds good but what does it actually mean? “Exhumes mystery”? It is obvious, however, that de Vries believes progress will be hard and that fiction must reflect this. But this sentiment stands in marked contrast to his facile opening story, ‘The Earth Of Yunhe’. Nor am I convinced ‘The Greenman Watches the Black Bar Go Up, Up, Up’ is much better in this respect. The Greenman is Inácio Lima, “soldier-turned-analyst”, a revolutionary in the Green War who – having won – returns to his home town of Recife, Brasil to become a sustainability consultant. The story starts as he is employed by a group of anonymous teens to perform ethical due diligence on a company they are interested in investing in. It is a nicely understated premise but unfortunately lacks any tension in its resolution. Inacio makes a couple of phonecalls, goes to visit a few people; this allows Barcia to fill us in on his world and background in a way which very much falls into the category of worthy but dull. Then Inácio’s dead husband Lúcio turns up. Before the reader has much chance to ponder this strange development, Barcia rushes us to our conclusion by having Lúcio spill the beans. Turns out the company Inácio is investigating have succeeded in uploading human consciousness to computers and, unbeknownst to him, Lúcio was the first successful subject. How very convenient. (The story also shares the same contrivance as ‘The Earth Of Yunhe’ by having the local political leader being the protagonist’s dad.) Alas, immortality uses too much energy so Inácio has to regretfully advise his potential investors that they keep it off the market. This paradigm shift in human evolution is quickly and cleanly dismissed and everything is resolved with no mess or fuss. We close with a line of immortal badness: “He wondered what the carbon footprint for love is.” Oh dear, oh dear, oh dear. As you might be able to tell, I’m having trouble with the concept of “near-future”. What does it actually mean? As an analogous exercise, I tried to think of what I mean by the recent past. It didn’t help; it could be anywhere between the Second World War and last year. This story (like ‘The Earth Of Yunhe’) is set in the 21st Century at least several decades hence. Does that make it near-future? “Optimistic” is also a bit tricky because both of the first two stories in Shine take it for granted that the world will undergo devastating environmental and economic collapse. Sure, they hold out hope for the future after that but it seems like in this context optimistic means “life might be okay for my great-grandchildren”. Xiaohao has invented a whizzy bit of nanotech that cleans contaminated soil whilst also converting it into a “massive solar power plant, communications hub, and computational substrate”. Hooray! He promptly defects from Ecclesia, the “metanation” who have bankrolled his research, to take his invention back to his home town, Yunhe in China, which has been devastated by industrial pollution. They equally promptly charge him with sedition for formenting revolution with foreign technology and his dad, who happens to run the town, gives him a good kicking and throws him in jail. Never fear though, our narrator is his sister who soon allies herself to Xiao’s plan and organises an amazingly quick, easy and non-violent revolution. Optimistic indeed. ‘The Earth Of Yunhe’ highlights the problem with Jetse de Vries’s call for solutions. Xiao’s invention is essentially a magic bean; this is not constructive thinking so much as wish fulfillment. The story itself suffers from being so compressed that all its events seem ludicrous or contrived or both. Most of us live in a world where more and more places and things are signposted, labelled, and officially ‘interpreted’. There is something about all of this that is turning the reality of things into virtual reality. It is the reason why walking, cycling and swimming will always be subversive activities. They allow us to regain a sense of what is old and wild in these islands, by getting off the beaten track and breaking free of the official version of things. 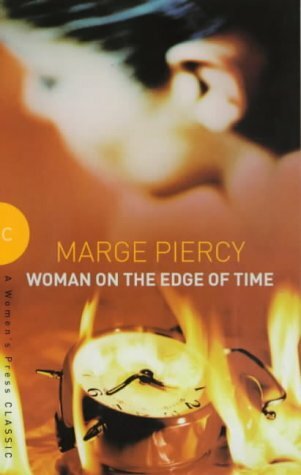 The frustration continues when Piercy attempts to inject some ambiguity into the novel without fully committing to it. For the majority of the book, the 20th Century of Connie’s captivity serves chiefly as a frame for the philosophy of the future. We still get quite a bit of the mundane battles of everyday life but the novel (like Connie herself) constantly escapes to tomorrow. Into this is gradually salted the idea that the future is not necessarily The Future: “Yours is a crux-time. Alternate universes co-exist. Probabilities clash and possibilities wink out forever.” (p.177) If alternate universes exist then by their very nature they are infinite; to suggest that the Seventies are a special crux-time simply because that is when Piercy is writing suggests an enormous lack of perspective. It also once more moves the book from the realm of speculation to that of woo. But Piercy goes further than this by suggesting that maybe Connie really is mad and that her future world takes place only in her head. It is the obvious direction to take the story but even given this still manages to disappoint in its execution. Hinted at throughout, towards the end of the novel we finally get to witness the idealogical war that is taking place in the future. It is a deeply unconvincing war so this could be evidence that we are not supposed to believe it is real or it could be evidence of a paucity of talent on Piercy’s part. This war then becomes a metaphor for Connie’s external struggle against the jailers. Or does it become a metaphor for Connie’s internal struggle against her mental illness? “War, she thought, I’m at war. No more fantasies, no more hopes. War.” (p.338) I can’t find any coherent way of reconciling these readings of the novel with what we know of Connie. The question of her sanity is imposed rather than arising from the text; the ambiguity here is careless rather than enticing. Is she mad, in a coma or back in time? To which I can only answer: who cares?